Pollution and over-use of the Ganges is seeing one of the world’s great rivers heading in the direction of other East Asian rivers that have been made unusable at a time when water quality and shortages are becoming critical — unless something is done about it. A Hindu devotee takes a holy dip in the polluted river Ganga (Ganges) in Allahabad. The Indian government is aware of the Ganges pollution problem and wants to do something about it, but the impetus to do so is not there yet. In the meantime, “Indians are killing the Ganges and, in turn, the Ganges is killing Indians,” said journalist and author Victor Mallet during a Club lunch to talk about his new book, “River of Life, River of Death: The Ganges and India’s Future”. “The Ganges, I argue in the book, is the world’s most important river,” said Mallet, who is the FT’s Asia News Editor. “We all know that rivers are crucial for life and civilisation and almost all the great cities of the world are built at river mouths, river confluences or river banks. Mallet said although the book is a celebration of the Ganges, it is also a lament. “I think the Ganges is the most important as it has a place in culture and history — from the great works of literature to Bollywood movies, but also in Western literature. Indian scavengers look for coins and other valuable items from among the offerings of devotees in the Ganges at Varanasi. The Ganges is the most important because of two main intertwined reasons: the spiritual and the practical. “The Ganges is holy to more than a billion Hindus in India and around the world,” he said. “Ganga is a goddess, she purifies the waters so that as a Hindu you want your ashes scattered on the river — particularly at Varanasi. The word India itself derives from the Sanskrit for a large river and to be an Indian is to be a river person. Mallet said this was why India has been one of the most populous places in the world and one of the richest. That wealth — and pre-historic wealth — attracted the Moghul and British empires. And, if you look back at the statistical calculations, India once accounted for a quarter of the world’s GDP, a larger share even than China a thousand years ago. Flowing from the eastern Himalayas, through the Plain of North India and into Bangladesh, the river is now under serious threat from human sewage, toxic waste, antibiotics, fertiliser and pesticides, he said. A series of dams along its course means that, in places, it can sometimes run dry outside of monsoon season. And a lack of accountability within successive Indian governments has played a large part in the decline of the river, Mallet added. However, Mallet is optimistic that the river can be saved. He draws comparisons with other rivers such as the Thames and the Rhine, once both heavily polluted but now home to thriving ecosystems. He was also hopeful that India’s prime minister, Narendra Modi, would deliver on his promise of cleaning up the river. Japan’s Prime Minister Shinzo Abe (centre L) and India’s Prime Minister Narendra Modi (centre R) take part in the evening ‘Aarti’ ritual on the banks of the River Ganges at Varanasi. Mallet noted a further problem: that the campaigners he had spoken to in India during his extensive research for the book had turned out to be the same people who had spoken to writers decades before – indicating that “a lot of young Indians are not really engaged in what should be an important mission”. Mallet said he didn’t want to be pessimistic. “You can save rivers. When I was growing up in London my mother said don’t fall into the Thames you will go to hospital and have your stomach pumped because the water is poisonous. “These days from the FT headquarters on the banks of the Thames — you can see a clean river with fish and cormorants and even wayward whales sometimes. “The Chicago River used to be disgusting. When President Obama met with Modi in 2014 when discussing environmental issues, Obama mentioned you can now fish in the river and even eat them. And Modi said that was what he wanted for the Ganga. “You can hope something can be done when you look at how some of the states stage those massive religious festivals. In 2013 I went to a festival in Allahabad in Uttar Pradesh, probably the world’s largest gathering of human beings — some 70 million gathered over a two-month period, although some 10 million bathed in the river on the first day. The point of this is that the state authorities actually build a temporary city for two million people on the sandbanks in the middle of the Ganges with roads, electricity, toilets, law and order, clean water and everything works… and it’s not very expensive. So it can be done. “On the negative side Indians will say, ‘Oh, that’s the Indian wedding syndrome’, which means that when you want to really pull together for one event you can do it, ‘but for everyday life we just cannot do it’.” That attitude needs to be changed, he said. “When I was doing my research a lot of Indians I met told me that ‘pollution is no problem for the Ganga because the Ganga is very pure, she’s a holy goddess and nothing we do makes any difference at all’ — as he threw a plastic bag of garbage into the river. If most of the great cities of the world were built on rivers, why have the people who depend on those rivers so often poisoned their own water sources? How much pollution is enough to kill a river? And what is needed to bring one back to life? “As I grew up and began to travel, I saw, sailed on, walked along, and read about many more waterways, from streams and canals to the great rivers of the world. Some – the Nile, the Zambezi, the Essequibo, the Mekong – were remarkably clean, because of the absence of large cities along most of their lengths. Others, like the Rhine and the Seine, were so-so. And still others, particularly the waterways of densely populated Asian cities undergoing their high-speed industrial revolutions, were filthy. The Malaysian writer Rehman Rashid’s description of the Sungai Segget as a ‘rank, black, stagnant, noisome ditch, filling the town centre of Johor Baru with the aroma of raw sewage and rotting carcasses’ reminded me of Charles Dickens’s description in ‘Hard Times’ of a fictional town in the north of England that was probably Preston: ‘Down upon the river that was black and thick with dye, some Coketown boys who were at large – a rare sight there – rowed a crazy boat, which made a spumous track upon the water as it jogged along, while every dip of an oar stirred up vile smells’. Indian Hindu devotees perform rituals after taking a holy bath in the Bay of Bengal at the mouth of the river Ganges in Sagar Island, around 150 km south of Kolkata. “Spumous? If you’re looking for spumous, I can recommend the Yamuna River below the Okhla barrage in Delhi, after the city and the farmers around it have taken most of the clean water for irrigation and drinking and replaced it with a mixture of industrial waste and the untreated sewage of one of the world’s largest cities. “At dawn, the great mounds of white foam thrown up by the barrage are tinged with pink as they float gently across the oily, black surface of a holy river once celebrated in ancient Indian literature as a paradise of turtles, birds, fish, deer and the gopis or female cowherds who tended to the playful god Krishna. So disgusting is this water that the latest official measurements I could find from Okhla show it to contain half a million times the number of faecal bacteria allowed under the Indian standard for bathing. The Yamuna just below Delhi is already dead, but the Ganges itself, while gravely threatened by pollution and over-extraction of water, is very much alive… you can see fresh-water dolphins far up the river in Allahabad, Varanasi, and Patna. “While Modi has made saving the Ganges one of his policy priorities, he does seem to have the political will to save the Yamuna and the Ganges, and he would certainly win the backing of the majority of Indians for the improved sanitation and pollution control that will be necessary. There is money there too, including US$1 billion from the World Bank in what would be among its largest ever projects. Unfortunately for Victor Mallet, the distinguished correspondent and now Asia news editor for the Financial Times, Hinduism’s greatest religious festival, the Kumbh Mela, during which as many as 100 million people gather to wade into India’s holiest river, occurred on his watch. The river, known by many names but most commonly as the Ganges, is no pristine water course. Instead, it is a creeping cesspool of human waste, chemical and industrial effluents, plastic and styrofoam rubbish, human remains both ash and not, animal carcasses, household garbage, and poisonous run-off from fertilised fields. But, it is sacred in Hindu tradition and immersion in its waters during the Kumbh Mela spiritually redeeming. On the river bank, notebook and pen in hand, Mallet, the most meticulous of reporters, knew there was no choice. In he jumped. That he survived his plunge into these stygian waters is in itself miraculous. But he emerged to write a wide-ranging and thoughtful account of India’s most important river. Its importance, however, stems not from its riverine qualities, but from its environmental degradation on the one hand and its hot button religious symbolism on the other; indeed, what other river in the world lures hundreds of thousands of naked sadhus to its banks as an exercise fraught with religious as well as political fervour. For Hindus the sacred nature of the Ganges is a bedrock belief. “We do believe that anyone who takes a dip in this water, he becomes pure also, because it is always pure, though it looks like it is impure,” an elderly pilgrim told Mallet. It is the centrality of that belief and the rituals that surround it that have fuelled the rise, and now the dominance, of the Hindu nationalist Bharatiya Janata Party. With a deftness that some might describe as shameless, the party’s leader, Narendra Modi, the virulently anti-Muslim chief minister of Gujarat, steamrolled the Congress Party by accusing it of doing nothing to clean up the sacred Ganges. The BJP, Modi thundered, was the only party capable of restoring the river to its historic purity. Wielding religious symbols as political cudgels is hardly confined to India, but in a nation sharply divided on sectarian grounds, and where religious passion can, and often has, ignited waves of bloody violence, these symbols become culturally defining. For the BJP, the rise to power began 25 years ago with the destruction of a disused 16th-century mosque by mobs of Hindu zealots whipped to a frenzy by BJP politicians screaming that Hinduism was under attack. While the BJP hesitated then in its pursuit of power, in 2014 Modi swept to power and the Ganges and everything it symbolised was at the centre of his victory. “Ma Ganga has decided some responsibilities for me,” Modi declared. Among them, cleaning up the river. Two years and a few cosmetic projects later, the Ganges remained unchanged. Now ensconced as prime minister, Modi’s attention had shifted. As thoroughly as Mallet describes the interweaving of religious belief and political practice, he is alarmed by the critical state of the river itself. But so degraded is the Ganges by pollution, damming, and draining by upstream agriculture that it is difficult to catalogue the full extent of this cataclysm. For Mallet it is a catalogue of horror, and it starts in the foothills of the Himalayas, in a major tributary, the Ramganga. At first there are just discarded cigarette packs and a scattering of plastic bags. As he moves on, the river becomes edged with paper mills, sugar plants, brass foundries and plastics factories, all disgorging waste into the waters. “Downstream,” he writes, “the sandy banks and the exposed riverbed present an apocalyptic scene of filth and garbage, of dead dogs, plastic bags, nullahs (drains) spewing pink dye, and pigs rootling through the muck.” Toxic chemicals, including heavy metals mercury and arsenic, pour out of thousands of home business “e-waste” recycling work sites. Even the oxygen level of the water has decreased so much that fish cannot survive in sections of the river. The impact of this destruction of the river on people’s health is unsurprising. Skin disease is widespread and cancer rates seem correlated to the increase in heavy metals in the water. But even more alarming, Mallet points out, are “bacterial genes exposing water-users to the risk of infections that resist modern antibiotics…superbugs.” Every day, 1,200 to 1,500 children die of cholera, hepatitis or other waterborne diseases. An accomplished sailor, Mallet writes as well of boats on the Ganges but is reduced to historical accounts of river navigation. “You could spend days on the Ganges,” he writes, “without seeing a single vessel of any sort under sail.” Where in the 1970s some 5,000 large commercial vessels travelled inland waterways, at best 150 do today. 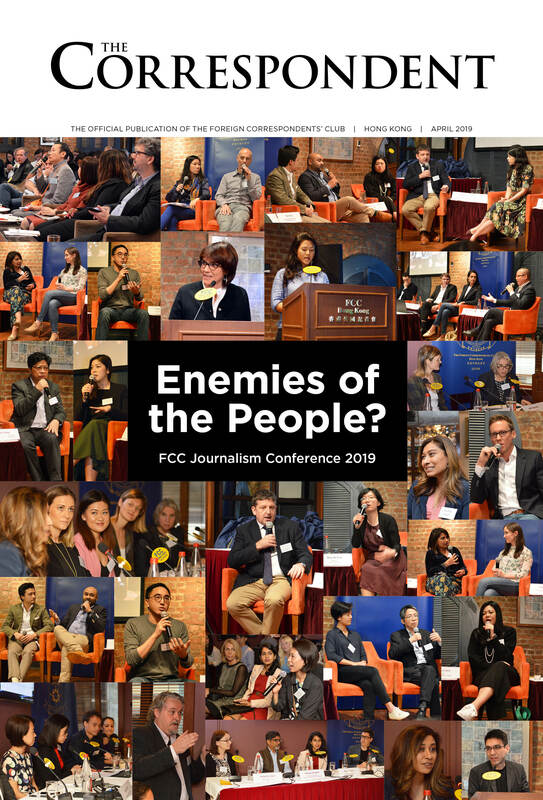 Ed Gargan, former New York Times Hong Kong bureau chief and Beijing correspondent, is another FCC member who has written about a river. His river is the Mekong, and the book: “The River’s Tale: A Year on the Mekong”.